One of the most common and incredibly irritating problems at home is a clogged toilet. There are few things more panic-inducing than watching the water level of the toilet rise and having no means to stop it. Most people have to deal with this household problem at one time or another, so it’s a good idea to learn how to address it properly. For most cases of a clogged toilet, the solution is a simple toilet plunger, but if you don’t know better, you might think that all plungers are the same. The truth is that there are two types of plungers, and they both serve separate purposes. 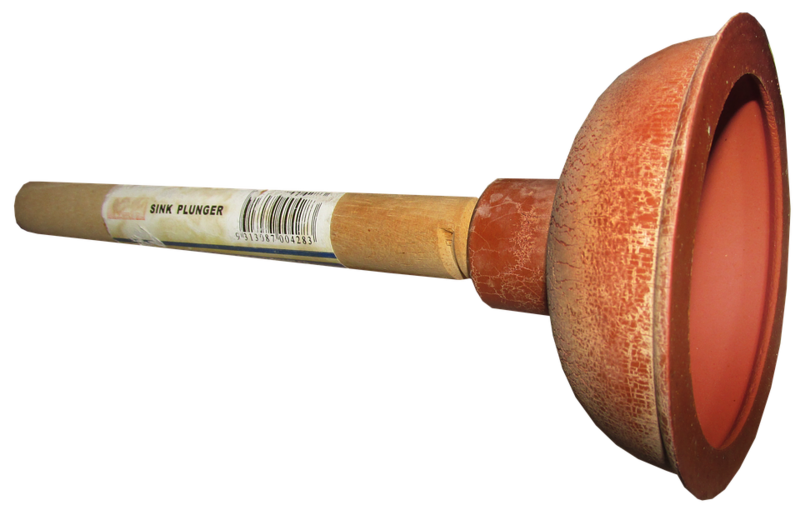 Cup plunger: The most basic kind of plunger is the cup plunger or sink plunger. It has a rubber cup that is dome-shaped with a flat portion at the bottom and is usually used to unclog tubs and sinks. The flat bottom of the cup creates a seal around the sink or tub basin. It’s probably the plunger you first think of when you encounter a clogged commode, but it’s not a good choice for that situation. Toilet plunger: For purposes of unclogging a toilet, the tool required is a toilet plunger, which is also known as flange plunger. This plunger has a cup that is taller than the cup of a sink plunger. It also has a sleeve-like extension, or flange, on the bottom of the cup. The flange extension fits into the hole of the toilet bowl to create a good seal. It’s not a good choice for unclogging sinks or tubs, but you can make temporary modifications if the need arises. Fill the toilet bowl with water – The first thing you need to check before using the plunger is the water level. The water should be deep enough to submerge the head of the plunger if you want to create an ideal situation for removing the clog. If there is not enough water to submerge the head of the plunger, gradually pour in cups of water until you have mostly covered the head of the plunger. Make sure it’s in the right position – First, make sure that the flange of the plunger is not folded inside the cup. Lower the plunger’s cup into the bowl at such an angle that will allow the cup to fill up with water. Going straight down is not recommended because it will simply trap a lot of air, reducing the plunging force. Fit the plunger’s cup over the toilet’s drain hole so that the flange is inside the hole and the cup forms a complete seal around the outside of the hole. Plunge away – Hold the handle of the plunger with both hands and push down on the cup with all your force. Pull back the plunger without removing the cup from the hole. Repeat the process about five times and pull the cup off the hole. The goal here is the creation of alternating forces of compression and suction to loosen the clog. Repeat this until the bowl is emptied of water. Test your work – Turn on the emergency shut off valve at the tank bottom. Flush the toilet and see if it flushes normally. If it does, you have successfully unclogged your toilet. If repeatedly using the plunger won’t dislodge the clog in the pipe, proceed to the next and final step: call in a qualified plumber.